Eight percussionists joined conductor Gregory Ristow and the College Choir — singing off-book — for an eye-opening, professional-level performance of Tarik O’Regan’s 2004-05 Triptych. This meditation on a world free of conflict stands out most for its unique combination of voices and, in this arrangement, mallet instruments, put across with unfailing blend at Carnegie. The work’s minimalist, modal, and mesmerizing sound world doesn’t stretch all that far from where it begins, but remains satisfying throughout, and always feels true. Probably the most enduring aural snapshot of the evening belonged to the second movement, when soprano Risa Beddie stepped to the front of the stage to deliver pure-toned, prayerful solos over a blanket of mallet rolls. Introduced by a djembe (that great goblet-shaped drum from West Africa), the third took on an insistent pace in Ristow’s hands, and an almost swashbuckling attitude. Triptych was paired with Stravinsky’s Les noces, calling for four pianos in addition to percussion, choir, and five soloists, including three students (soprano Katherine Lerner Lee, baritone Kyle Miller, and bass Evan Tiapula) and two alums (mezzo-soprano Perri di Christina and tenor Nicholas Music). All singers read from the score in delivering the relentless Russian text. Les noces shines in portraying all the grand drama that might surround a Russian peasant wedding. Higher and lower voices of the Choir took turns offering commentary in bold, breathless, and gripping fashion. Balance unfortunately was an issue, preventing the multi-layered texture from really taking shape and important solo moments from carrying fully into the hall. Occasionally ensemble fell just out of sync, but the spirit was always there in this exciting performance of a challenging work. Raphael Jiménez and the Oberlin Orchestra began the second half with Conservatory professor Elizabeth Ogonek’s 2017 All These Lighted Things (three little dances for orchestra). With vibrant colors, flexible mood, and a language that’s never dull nor over-the-top, it’s the kind of discovery you’re really happy to have made. Strong solo work could be traced back to just about every section of the Orchestra. Ogonek joined the group onstage to receive a powerful ovation. It’s easy to say from outside the inner workings of a team or an ensemble that its members just need to “come together” and “play as one.” From inside, the chemistry needed to make that happen can be frustratingly elusive, even with everyone’s best intentions. Closing their Carnegie program with Debussy’s La Mer, the Oberlin Orchestra played with an uncanny, cell-like sense of one another. Under their conductor’s calm and sensitive leadership, they oozed confidence, playing with trust, joy, and abandon. I could go on about all the things that make for great playing that were on display: the sense of arc, the spectrum of feeling. But basically, kudos. 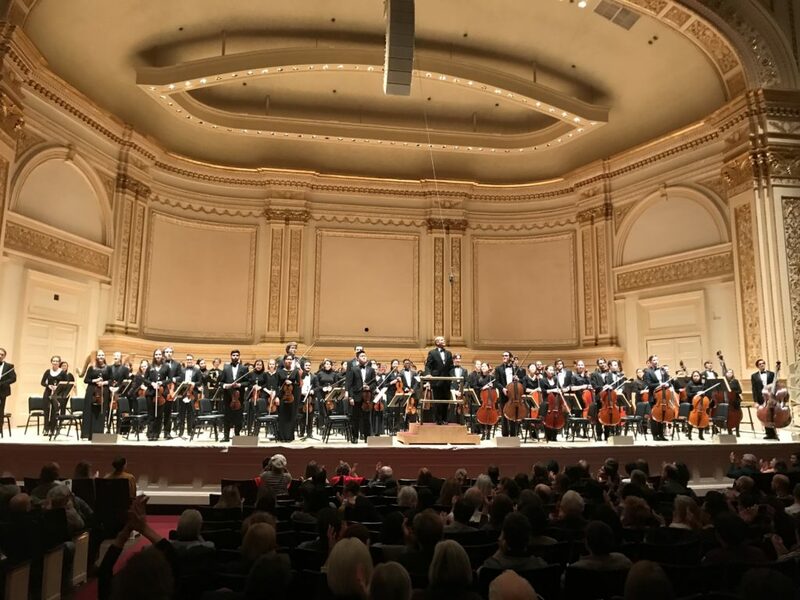 Published on ClevelandClassical.com January 29, 2019.